Building on picture study in the high school years can be such a rewarding way of living. I say so because it really has become so much a way of our life that it happens quite naturally. I plan six artists for the year and post the schedule in their art journals. Weekly, each of the boys chooses one of the featured artist’s paintings to save as the computer desktop, one for the family computer and one for my laptop. We use both computers in the course of our schoolwork and daily living. It is a common thing to hear someone ask who the artist is on the computer as the paintings change. Even my very busy husband will stop and view the painting and make comments. It is just this simple foundational activity that has led to so much more. I outlined in my last post, Part Two, how we built on picture study as we worked through the years. 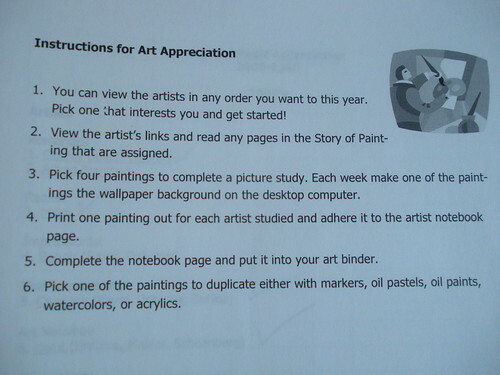 Now that we are in high school, I thought I might share what our art and artist study includes. I will give you some ideas from our plans to get your started thinking about ways you can incorporate them into your homeschool. You may not have any children in high school yet, but these are all ideas you can work on as you build up to the high school years. Keep it simple depending on the year. Not every year needs to focus on art history. Last year we kept our artists within our history time period, but we branched off and did a variety of art projects. You can read about one of our units here: Art Projects -Unit 1 Plans and Completed Projects. This year we are focusing on one particular art medium, pen and ink. Last year we did a whole unit on photography. Two years ago we did a lot of work with pencils. 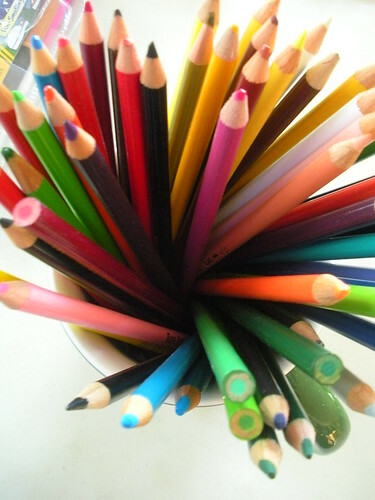 After you introduce all the different art mediums, your child will develop some favorites. I have one son that adores using markers and I encourage him to work with them every week. My other son loves working with oils and acrylics so those are always an option for use during his art copywork time. Give more flexibility in what artists are studied and in what way. As I plan next year’s artists, I solicited the opinions of my sons as I went along. 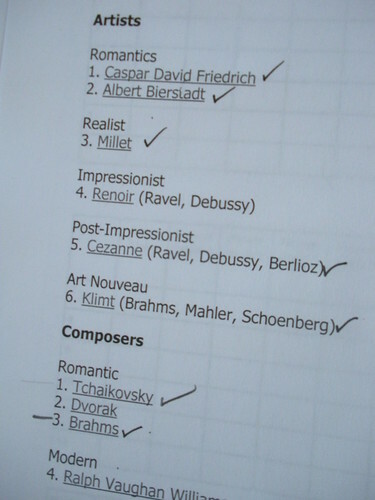 I made a list of possible artists and composers and asked for their input. Some of the artists they were not familiar with so they had to look them up before making a selection. 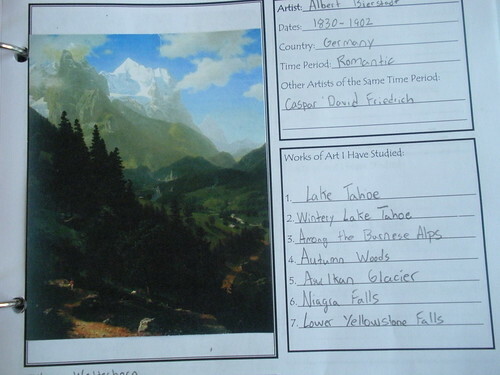 This led to some great converstation and then eventually a solid list of artists and composers to include in their fine arts study. I learned this year that my boys really like the freedom to chose their own follow-up art projects. They have chosen murals, collages, markers, acrylics, Prismacolor pens, oil pastels, and colored pencil projects to capture a painting of an artist or their style. I think they come up with far better projects than I can ever imagine assigning. It seems like every year we come up with a new area to explore. While studying ancient history, we included architecture as part of our art history study. 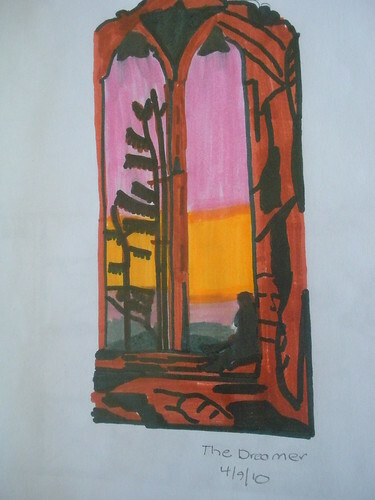 While studying Renaissance history, we dug into the ins and outs of stained glass. This year we have become extremely interested in the Impressionists and their relationship to each other as the style of painting developed. I am feeding that interest with books from our library and some pulled from our shelves. There may come a time when your child’s interest in a certain art skill will grow beyond your ability to help them. This is where a mentor comes in, either in real life or one you find online. My boys had a desire a few years ago to give pottery making a try. I found a local man who had a pottery studio and a wheel, along with a desire to teach children the basics of working with clay. It was a wonderful experience even though their interest in pottery making has waned. At present, they are happy to dabble with art supplies at home, using the resources we have available. If they come to a point where they wish to go further, I will find another mentor. If you built the fire in the early grades, it will still need some fuel to keep it going. Don’t fool yourself into thinking that your high school age children don’t need picture study. If you have developed an appetite for great art in the earlier years, the desire will still be there if you keep the ball rolling. Learn to work with a new art supply. Take a trip to a museum to see a special exhibit. Take a class to learn a new skill. Find a new art book to keep on your coffee table. Work alongside them and develop or refine your skills. Good ideas. It is so interesting to watch my son’s brain make connections. At least in art, his brain IS taking it all in. I have tried to use many of the ideas you have posted over the years and all have been worth it. I love being able to look ahead with you. It is easy for me to think I have to get all those great artists in NOW. Have you had any surprises in your sons’ picks of artists or media?